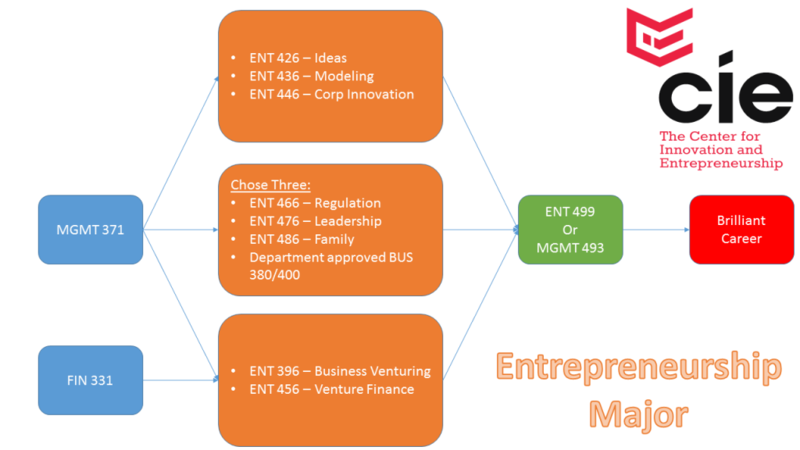 The entrepreneurship major is designed to teach and promote: opportunity recognition, opportunity assessment, risk management & mitigation, conveying a compelling vision, tenacity & perseverance, creative problem solving, resource leveraging, guerrilla skills, value creation, maintain focus yet adapt, resilience, self-efficacy, and building networks. The major consists of 6 courses and 3 electives. This course covers the entrepreneurial process from conception to birth of a new venture. It concentrates on the attributes of successful entrepreneurs, opportunity recognition, venture screening, identification of resources, and business planning to learn how to turn opportunities into a viable business. Through lectures, classroom discussions, readings, and evaluation of new venture opportunities, students will experience what entrepreneurs undergo throughout the entrepreneurial process of launching a new venture. Organizations – new entrepreneurial ventures, large corporations and nonprofit endeavors – need individuals who can identify problems, develop and implement creative solutions, find new opportunities and markets, and manage in ways that enhance others’ creativity. This is a course about the courage to create, to risk making mistakes and to risk failure in the quest for ideas that lead to true innovation of a product, service or process. This requires employees who think and behave as creative entrepreneurs. This course will help you understand the importance of entrepreneurial creativity and innovation, teach you to identify opportunities and provide you with techniques for coming up with creative ideas and solutions to problems. We focus on novel, appropriate and open-ended solutions to problems that may have never had to be solved before, due to changes in technology, society, culture, our environment, the economy, politics or other influences created by dynamic and exponential change. The course provides an introduction to Business Modeling of New Ventures. This course will explore and review the elements necessary in developing the business model for a new venture. This course focuses on the critical decisions and action steps that entrepreneurs must make in both planning and initiating a new venture. Students develop new venture implementation plans, and learn how to manage their execution. The first step in creating a successful new venture is the formation of a business model, which transforms the idea of the entrepreneur into that of a profitable company. The entrepreneur must first have their business model developed to the point that proves to themselves that the idea will result in a sustainable business and only then present it to the rest of the world (customers, capital sources, vendors, employees, etc…). A viable business model will not ensure success of the new venture, but without it, the business will fail. An examination of the essential institutional frameworks (innovation systems), concepts, methods and practices in the context of innovation management and the global economy. The focus of innovation management is to allow both the small and large organizations to respond to an external or internal opportunity, and use its creative (intrapreneurial/entrepreneurial) efforts to introduce new ideas, processes or products in order to gain and maintain a competitive advantage in the global business world. The flow of technology and information and the interaction between people, enterprises and institutions is the key to an innovative process in order to turn an idea into a process, product or service on the market. The course focus is on creating work environments in which entrepreneurial thinking and skills are used to recognize and exploit market opportunities that are usually stifled by conventional corporate culture and management practices. Entrepreneurship is all about the pursuit of opportunity and the creation of value in the marketplace. This often manifests itself in the launch of new venture endeavors. This course is an interactive, team-based, experiential program focused on guiding you through the start-up process with special emphasis on leveraging lean entrepreneurial thinking skill sets and tools as well as gaining a greater understanding of early-stage planning and testing through customer feedback. The course will be organized around lectures, readings, class discussions, workshops, and a team-based launch project. Students choose the teams and ideas. Each team should be multidisciplinary in nature. Students apply to the instructor for admission to the course. Preference for admission is entrepreneurship majors, but the course is not exclusive to them. This course examines the key human resource functions necessary to execute the business plan. It will examine the roles and activities required for growth and success including: HR (establishing company culture, roles and duties of employees, compensation for retention, establishing HR policies, and analyzing benefit options) and leadership in new ventures, small businesses, and family businesses. This course focuses on the opportunities and the problems characteristic of family businesses: creating new businesses, maintaining existing businesses, management succession, transfer of ownership, mixing family and business roles, family conflicts, personnel issues, non-family employees, innovation, transgenerational wealth creation, and the use of outside advisers. Note on grades: A grade of “C” or above is required on all required business discipline courses in the major. This is any course in the business school counted as part of the major as well as accounting and economics.